Jeff Bliemeister, Director, Railroad Museum of Pennsylvania, Strasburg, Pennsylvania, USA. Click here for the Railroad Museum of Pennsylvania Directory listing where you'll find links to all interviews with Railroad Museum of Pennsylvania in one place. Click here for more info and links to all interviews featuring Jeff Bliemeister. Nick Zmijewski, Collections Manger Museum Archives, Railroad Museum of Pennsylvania, Strasburg, Pennsylvania, USA. Click here for more info and links to all interviews featuring Nick Zmijewski. Owen Glendening, Associate Vice President of Education and Access, The National World War Two Museum, 945 Magazine Street, New Orleans, Louisiana 70130, USA. Click here for the The National World War Two Museum Directory listing where you'll find links to all interviews with The National World War Two Museum in one place. Click here for more info and links to all interviews featuring Owen Glendening. 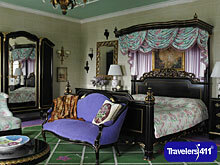 Ken Hayward, Managing Director, Grand Hotel, 286 Grand Ave., Mackinac Island, Michigan 49757, USA. Click here for the Grand Hotel Directory listing where you'll find links to all interviews with Grand Hotel in one place. Click here for more info and links to all interviews featuring Ken Hayward.